We do our best to keep our San Diego homes clean, but there is only so much we can do to protect our carpets. Over time, the carpet will collect spills, accidents, and dirt. Here are some of our top carpet cleaning tips and tricks! Some messes are too serious to get on your own, and for those, there’s SM Absolute. Contact us when you are in need of odor removal, water damage repair, or a major carpet disaster solution. Make sure to only blot the stains, but don’t rub them! We recommend using a cleaning solution with a clean cloth, paper towels, or a sponge. Blotting will soak up most of the stain while rubbing a stain around will actually press the particles into the carpet fibers. This can cause the fibers to break down prematurely. Always blot from the outside of the stain working inwards. If you don’t have a stain remover on hand, don’t panic! There are a few items that you may have lying around that could help. For example, club soda can help with beer and wine stains if you blot the area with a cloth soaked in the soda. If that doesn’t work, switch to a solution of one part vinegar and one part water. Let it sit on the stain for 10 to 15 minutes, then press a clean sponge into the stain to soak everything up. Repeat the process until you see results! Once the area is clear, we recommend rinsing the spot with warm water and brush the carpet back to the way it was before. Finally, place white paper towels over the spot and weigh them down with a heavy book or box. The towels will absorb the liquid, so leave them for about a day or until dry. Shaving cream is also a great product to use for stains! Apply shaving cream onto the stain and let it sit for about half an hour. Once it has set, you can blot it away with a white, dry cloth. 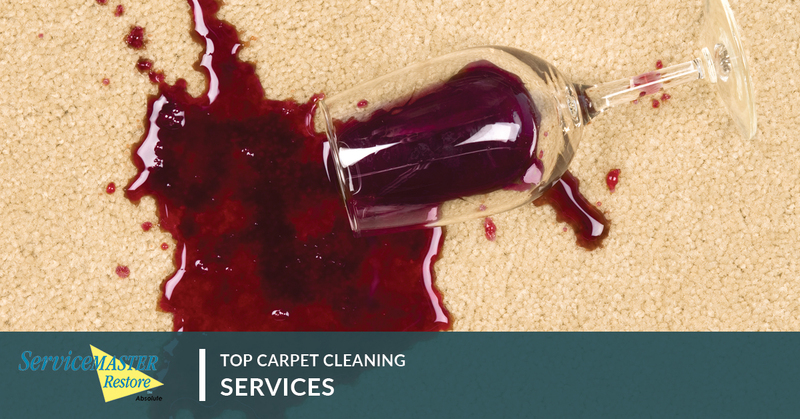 Spray the area with your vinegar and water mixture, then wipe away the solution and see the clean carpet underneath! We highly recommend steam cleaning your carpet every six months or so to release any trapped dirt and grime. Steam cleaning pushes a cleaning solution deep into the carpet, then the machine pulls out the solution along with the dirt. This leaves the carpet extremely clean and ready to keep your home feeling cozy and sanitary. If you are a candle enthusiast, you may have had issues in the past with wax spills on your carpet. These can be tricky to clean up! Place a white cloth over your iron, then place the iron over the wax spill to heat it up. Once the wax is warm, you should be able to take a butter knife and scrape off the stain. Afterwards, lay down a paper towel and iron over it to pull up the wax. Just be sure that you only use the iron like this for about 30 seconds tops. Otherwise, you could damage the carpet! While there are quite a few messes you can take care of at home, there are some that you just can’t handle. For example, emergency water damage will take a professional to clean up. Maybe you need odor removal from cigarette smoke in your carpet. Whatever it is that you need, contact our team! We are ready to help you. For those of you in San Diego and the surrounding areas, give ServiceMaster Absolute’s sanitation services a try.